How to Open a Swiss Bank Account - A guide to do it yourself. If for some reason you are looking for a bit more security, privacy or anonymity and protection than overseas Banks, look no further than neutrality at its best "Swiss Banks". Switzerland offers the best banking secrecy and stability in the world. 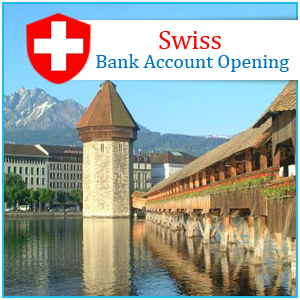 We help you to open your account at a major Swiss bank. Opening a bank account in Switzerland can be confusing and extremely time consuming unless you know intimately the Swiss banks, their policies and procedures. All banks in Switzerland operate in world class standards. Apart from that, staff working in Swiss banks are very famous for their knowledge and expertise in banking. Opening a Swiss Bank Account is not to be confused with the opening of a Swiss Private Bank Account or any other Offshore Bank Accounts, the services offered are varied. Swiss Banks welcome accounts from foreign residents all over the world. The main reason for wanting a Swiss bank account has to deal with the legendary privacy such an account provides. Investigate which Swiss Bank Account Services you require, they include Wealth Management, Investment Solutions, Venture Capital and Trust Formations, to name but a few. Know that If you're looking for a way to "protect' assets from snoopy investigators, a Swiss account can be the ideal place. Contact an established bank in Switzerland. The Swiss Bank will advise you on the best options available for you. If you have liquid assets worth $300,000 or more you may wish to investigate Swiss 'Private' Banking further as their are a wide array of services offered for substantial amounts. The Swiss have some of the tightest regulations in the entire world as far as who can gain access to your account. Currently an estimated one-third of all funds held outside their country of origin (sometimes called "offshore" funds) are kept in Switzerland. A financial background check on any individual wishing to open an account is now policy for Swiss Bank Accounts. Surprisingly, opening a Swiss bank account is not that much different from opening a standard bank account because you have to fill out forms and provide documentation that proves who you are and what you do. However, due to some special circumstance regarding privacy, the level of scrutiny over providing official documentation of your identity is more strict. For example, you may need to show your official passport to provide your identity, whereas a driver's license would probably suffice in the U.S. There are also different minimum balance requirements depending on the type of account you want. These can range from a few thousand dollars to millions of dollars. The main benefits of Swiss bank accounts include the low levels of financial risk and high levels of privacy they offer. The Swiss economy is one of the most stable economies in the world and has not been involved in any conflicts in hundreds of years. Furthermore, Swiss law requires that banks have high capital requirements and strong depositor protection, which practically ensures that any deposits will be safe from financial crisis and conflict. In terms of privacy, Swiss law prevents the bank from disclosing any information regarding your account (even its existence) without the depositor's permission. The only caveat is that the information will be revealed if a government agency makes the claim that a depositor is involved in a serious criminal act or is involved in some other financial issue (such as bankruptcies, divorces and inheritances). Furthermore, Swiss anti money-laundering regulations also require depositors to provide proof regarding the origin of where the money being deposited came from. Types and group of Banks: Private banks – Private bankers, Cantonal banks, Raiffeisen banks, Investment Banks, brokerage banks. There are over 400 Banks in Switzerland among private banks, retail banks, comercial banks, cantonal banks, investment banks and many more. Due diligence Banks are member of the Swiss Banker Association: SBA and are authorized as Bank and Securities Dealer. The body controlling the proper operation of institutions is FINMA: Swiss Financial Market Supervisory Authority. The country's tradition of bank secrecy, which dates to the Middle Ages, was first codified in a 1934 law. Deposits in the form of Savings Accounts, etc. These universal features are disabled in the banking sectors of various countries and commercial banking and investment banking tend to be in separate form. Swiss banks have earned a great reputation worldwide for providing sophisticated and discrete banking services. There are about 400 banks in Switzerland. Banks are licensed by the Swiss Federal Government through its Banking Commission, and operate throughout the country. Most of the banks in Switzerland offer the following common types of bank accounts for foreign customers.